: Shepherd Dog used for guarding sheep. Active breed originally used as a guard dog for sheep; hard working; capable of enduring extremes of heat and cold. 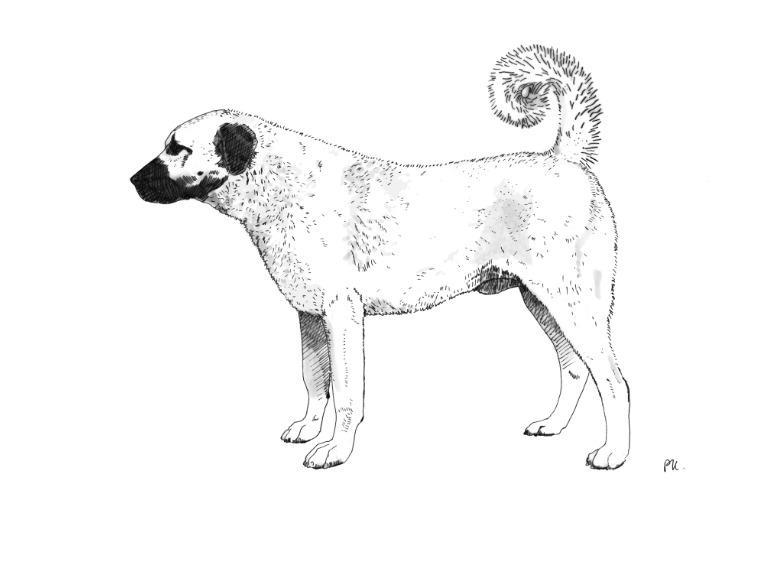 : The Anatolian Shepherd is a shepherd’s guard dog of ancient lineage, probably descended from the large hunting dogs existing in Mesopotamia. The breed has evolved over the ages to suit a specific set of circumstances. Of these the most formative are the climate – hot and very dry summers, very cold winters – the peoples’ life-style- settled, semi- and wholly nomad – and the work assigned to the dogs. They guard flocks travelling great distances on the Central Anatolian Plateau. They stay out whatever the weather may be. : Large, upstanding, tall, powerfully built, livestock guarding dog with broad, strong head and dense double coat. Must have size and stamina. Capable of great speed. : Foreface slightly shorter than skull. : Steady and bold without aggression, naturally independent, very intelligent and tractable. Proud and confident. Loyal and affectionate to owners, but wary of strangers when on duty. : Large, but in proportion to body, broad between ears, slightly domed. Mature males have broader head than females. : Black, except in livers, where it is brown. : Seen from above almost rectangular. Profile blunt, tapering very slightly to end. : Very slightly pendulous, black-edged. Edge of upper lip not lower than the profile of the underjaw. Corner of mouth tight. : Teeth strong, with a perfect scissor bite, i.e. the upper teeth closely overlapping the lower teeth and set square to the jaw. Complete dentition. : Rather small in proportion to size of skull, set well apart, showing no haw. Golden to brown in colour according to coat colour. Eye rims black except in livers. : Medium sized, triangular in shape, rounded at tip, pendant with front edge close to cheek, higher when alert. : Powerful, well muscled, never flat sided. : Horizontal, slightly arched over loins. : Rather short in proportion to leg length. : Deep to point of elbow; ribs well sprung, ribcage sufficiently long. : Belly well tucked up. : Long, reaching to hock, set on rather high, when relaxed carried low with slight curl; when alert carried high and curled over back, especially by males. : Set well apart straight and well boned; of good length. : Close to sides, free moving. : Strong, slightly sloping when viewed from side. : Strong, with thick pads and well arched toes. Nails short. : Powerful, not overloaded with muscles. Hind legs vertical when seen from rear. : Very noticeable level line of body, head and neck when walking, movement even, supple and long reaching, giving impression of stalking, with great power. Pacing acceptable at slow speed. : Short or half-long, dense, with thick undercoat. Great variations in coat length according to climate. Longer and thicker on neck, shoulders and thighs. The coat tends to be longer in winter. Low to ground, heavy and slow, too massive; too light in build. Hackney action, mincing gait, stiffness. Coat too long and hanging. Muzzle too short (one third of the total length of head). Coat very short and smooth, devoid of undercoat.